Imagine Myanmar State Counsellor Aung San Suu Kyi resigns, goes into exile, and apologises for her conduct after the Rohingya massacre. Would this improve the prospects of justice for the events in northern Rakhine State? We think not. This kind of public diplomacy is misdirected and should be focused more firmly on the Tatmadaw (Burmese military) and its relations with the international community. There needs to be a much deeper strategy here because the military may now be emboldened in its operations against other ethnic groups, and the democratic moment is being lost. Moreover, the humanitarian situation facing those displaced is dire and unresolved. What is the efficacy of current international advocacy efforts to promote human rights and accountability in Myanmar in response to the Rohingya mass atrocities? The attitude of the West towards Aung San Suu Kyi may be a good example of what Cass Sunstein calls the dynamics of outrage. The West made a mistake making a saint out of Daw Aung San Suu Kyi instead of treating her as a politician, and now it may be making her a sinner without due reflection. 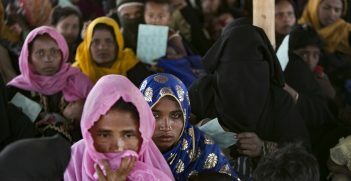 Let’s unpack the three assumptions in this sentence: authority, power, and the impunity of Myanmar’s security forces, to illustrate why the international response has struggled to mount an effective attack on who is responsible for failing to protect the Rohingya from displacement and mass atrocities. First, her position of authority: Aung San Suu Kyi entered a unique power-sharing arrangement after her party—the National League for Democracy (NLD)—won a majority in the upper and lower houses of parliament in the 2015 elections. She was state counsellor to then President Hten Kyaw, who was the first elected civilian president (elected by joint session of parliament). She was never going to be president because of the Myanmar constitution having strict citizenship rules attached to who can hold the role of president if they have family members who are citizens of another country. Her marriage to a British citizen and her children’s British citizenship prevented Aung San Suu Kyi from becoming president. Aung San Suu Kyi’s authority rests on the parliament approving her self-styled role; it has no precedent and is not a constitutional role. Her president is serving with the direct election of the parliament. 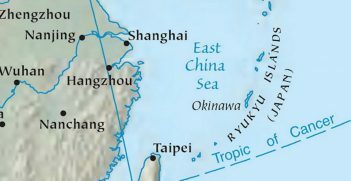 There is no other route to these roles without the support of the Tatmadaw. The question that then follows is what of her power in the role as state counsellor? Why has she not sought constitutional change? Despite all the democratic reform, Myanmar remains one of the most militarised states in the world. The 2008 constitution has not removed the central authority of the military from government or from parliament. In both the upper and lower houses of federal parliament, 25 per cent of seats are reserved for Tatmadaw. Very few bills can pass without Tatmadaw approval. Any amendment to the Constitution requires 75 per cent majority in both houses. Seeing some political parties have seats thanks to the patronage of the military there is no reason to think that constitutional reform is an easy task. In the government, under the 2008 constitution, the Defence, Home Affairs (which decides on budget and appointments at central, state/regional, even village), and Border Affairs Ministries are held by Tatmadaw. The pace of democratic reform has been progressive compared to what existed prior to the first round of federal elections in 2010 but, let’s be clear, her ambition is no doubt for the long term: to hold the NLD majority in successive elections so that she has the chance to try and introduce bills that can pass the upper and lower houses of parliament without Tatmadaw opposition; to eventually, perhaps, introduce constitutional change to reform government and to wrest some more control back from the Tatmadaw. Presently, her power and authority does not extend to the village and state level in the same way that the Tatmadaw authority extends. This is deliberate. Their continued hold over the three crucial ministries ensures their reach into most parts of the country. The impunity of the military exists because of structure, institution and politics. Aung San Suu Kyi has minimal influence in any of these. The military, as explained, has a constitutional role in the running of the country. It has a strong presence in the security, administration, and political institutions throughout the country. The Tatmadaw has a strong association and affinity with the Buddhist religion and with the idea of the nationalist Bamar project. Some ethnic plurality is accepted but the protection of this Bamar identity, that enshrined what it was to be Burma in 1962 (which led to the coup), is the same today for the Tatmadaw. The 1962 coup occured because the then Tatmadaw leadership could not abide by a federal Burma that accommodated autonomous rule by ethnic minorities. Today, the country is attempting its largest Nationwide Ceasefire Agreement (NCA) since the 1947 Panglong Peace Conference. But the NCA is undoubtedly being drafted on Tatmadaw terms: the 2008 constitution is not up for discussion, transitional justice is not in the agreement, and impunity has been granted for both the Tatmadaw and the ethnic armed groups that sign the NCA. Moreover, even if the NCA did not provide blanket immunity, the 2008 constitution already provides it for the military. 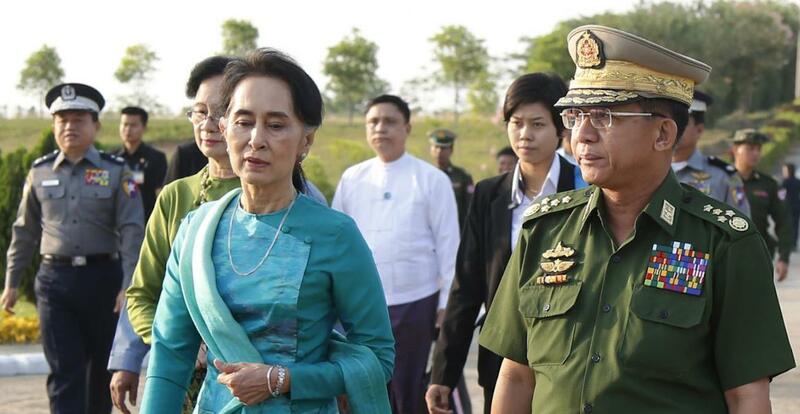 Her power and authority to challenge the constitution is minimal and the constitution is set up to protect the Tatmadaw in precisely these circumstances. The idea that she bears responsibility for the crimes committed in the Rakhine state is only true in the sense that she has not publicly denounced the actions of the Tatmadaw, nor has she attempted political suicide in attempting to introduce a bill into parliament to set up a commission of inquiry, or to permit an international commission of inquiry to investigate the crimes that took place in Rakhine. These are more realistic criticisms: Aung San Suu Kyi is failing to try to build a political consensus within Myanmar that challenges the authority and power of the military. However, this position ignores (or is simply ignorant of) the inconvenient truth about the Rohingya cause in Myanmar: this is not the issue to rally against the military’s authority. There is no public support. If a referendum were held on the question of permanently expelling all Rohingya from Myanmar, it would pass easily. We have witnessed first-hand people from politics, academia, government and human rights groups speak of tolerance, women’s rights and democratic reform until we reach the topic of the Rohingya in Rakhine State. There is a war of perceptions inside Myanmar. The groups who have taken a public stance against the crimes in Rakhine—the Karen Women’s Group and the Women’s League of Burma—have done so at great personal risk and face political exile for their expression of solidarity with the Rohingya. This is an issue crying out for reframing, as the United States Institute of Peace has noted. We agree that international diplomats, media outlets and human rights agencies should consistently highlight the plight of all ethnic communities in Rakhine State affected by the crisis. All parties require aid and assistance. Further, we should press for the plight of other ethnic groups to also be heard whilst international attention is on Myanmar. The situation between the NLD, the Tatmadaw and the nationalist monks is very tense. President U Htin Kyaw resigned this week, stating he needed rest, but Western media barely covered the story. Aung San Suu Kyi’s house was recently firebombed, and don’t forget that early last year, her closest legal adviser Ko Ni was shot at Yangon airport with his infant grandson in his arms. Our suggestions are thus less focused on what one individual—Aung San Suu Kyi—should be doing and more focused on what neighbouring states could do to protect the people facing these mass atrocities. These suggestions will be discussed next week, in the second instalment to this series, Justice for Rohingya: Regional Responsibility. 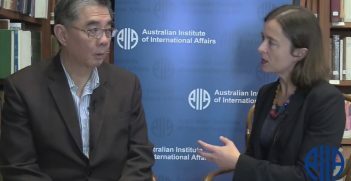 Dr Susan Harris Rimmer is an associate professor and Australian Research Council future fellow in Griffith Law School, and an adjunct reader in the Asia-Pacific College of Diplomacy at the Australian National University. Dr Sara Davies is an Australian Research Council future fellow and associate professor with the Centre for Governance and Public Policy, School of Government and International Relations, Griffith University. She is also an adjunct associate professor with the School of Social Sciences at Monash University. Sara and her Griffith colleague Professor Ian Hall were recently appointed the new editors of the Australian Journal of International Affairs, which is published by the AIIA. This article is part of a two-part series examining the Justice for the Rohingya and encouraging Anti-Impunity Measures in Myanmar. Addressing sexual violence is not a negotiable condition for achieving peace. With more information on the location of crimes and the perpetrators, we can use data and knowledge on patterns of reporting to intervene.